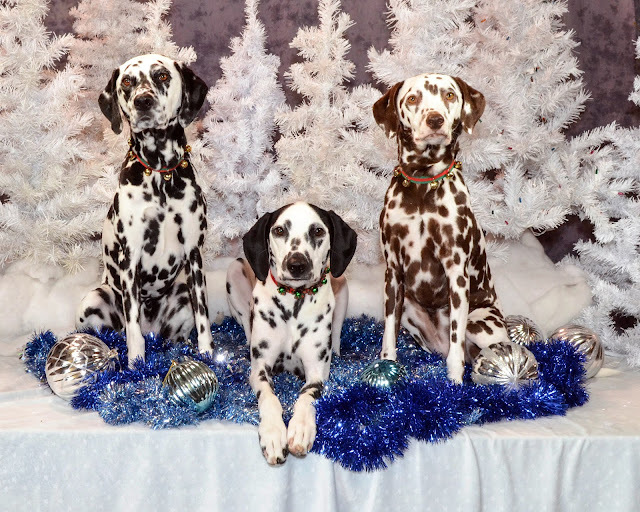 How could Santa not love these three adorable spotty faces?!! My great-nephews Logan and Ryan joined us on Christmas Eve. Jazz wasn't too sure about two active toddlers, Tess was more interested in the Christmas gifts, and Indy thought it was one big p-a-r-t-y to have two little boys to run around with!! Here's Tess and Jazz unwrapping one of their gifts. Indy play-bowing to Jazz, hoping to get his chance to play with the new warthog toy. Indy, Jazz, and Tess in the aftermath of their present-opening frenzy. Tess not only loves to open her gifts, but she likes to make sure the wrapping paper is shredded into tiny pieces. Hope everyone had a good holiday. We enjoyed time with family, human and canine. Each of our dogs is truly a Christmas blessing and we couldn't imagine a better gift! Since we are hosting my family's Christmas Eve celebration, I suspect things will get hectic around here tomorrow, so I wanted to post our Christmas greetings! A very Merry Christmas from our family to yours! I'm a little behind in posting (and just about everything else), but the dogs had their holiday pet therapy visit at the hospital Wednesday evening and some pictures we took are below. Here's the three therapy dogs, Jazz, Sammie, and Tess, in front of a beautiful display of poinsettias in the lobby. The girls were wearing their Santa outfits and Uncle Jim kept telling everyone they were "Santamatians." We also teased everyone that the girls were getting holiday pay for wearing the Santa suits. Everyone got a good chuckle over that. Jazz and Tess in front of one of the beautifully decorated trees at the hospital. Here are the girls again showing off their Santa suits in front of the poinsettias. When we placed the three dogs in this location, people gathered and cell phone cameras were going off all over! One young couple stopped and asked to take a photo. When we agreed, the husband handed the cell phone to his wife, and she promptly suggested that he take the photo himself, since it was his phone. Well, he insisted that she take the photo, because he was going to get in there and pose with the dogs, which he did, to her chagrin! It was a very funny exchange. We love our pet therapy visits at the hospital. The dogs are appreciated by so many, patients, staff, visitors. The staff from the floor we visit sent a tray of cookies for us because they wanted us to know how much they appreciated the pet therapy visits. They say the patients are still talking about the dogs the next day! The pet therapy program has grown at UPMC Passavant, and we're very happy to be a part of that. While we're off for the holidays, we're going to make a special visit to the Cancer Center. The dogs will spread a little holiday cheer to folks receiving their chemo treatments. We wish we could visit there more often, but we have to go during the daytime hours and we can only do that when the three handlers are off of work! Happy Holidays from the hardest working "Santamatians" in town!! Today we celebrated Jazz's fifth birthday. She's had a wonderful year, earning her Rally championship (RAE) and her CPE Agility championship (C-ATCH), as well as excelling in her role as best friend and snuggle buddy! As always, we celebrated with a doggie birthday cake. Jazz even got a birthday card and an extra bag of homemade treats from the bakery! Since it was Jazz's big day, we gave her the first shot at nibbling on the cake, and as you can see, she enjoyed every bite. Of course, no party is complete without the whole gang, so we let Tess and Indy in to share Jazz's cake. All of the dogs know about birthday cakes, and Tess even recognized the box from the bakery when I brought it home!! As you can see, we have no problems with our dogs sharing goodies. They all dove right in and demolished the cake and then cleaned the crumbs off the floor. Now all three are contentedly napping in their dog beds with bellies full of birthday cake!! Jazz's litter was known as "The Bathtub Gang," because their breeder snapped a photo of all 10 puppies in a bathtub that became the cover of her book, A Tail of Ten Puppies. Today, LaDonna sent us a Smilebox slideshow of some of the outtakes from the bathtub photos. You can view that here. In some ways, it seems likes the five years we have had Jazz have just flown by, and in other ways, it seems like Jazz and I have been together forever. This is the dog I call "Mini Me" because we are so much alike. Words cannot express how much joy Jazz brings me, whether as a team in the obedience, rally, or agility ring or gaiting along with me and Rocky out on the trail or just snuggling at home on the couch. I can't imagine life without my little brown Dal and look forward to many more birthday celebrations. Indy and the girls got to do a Tunnelers Fun Run last Friday evening out at B&D Creekside Activity Center in Latrobe. It was a benefit for the Latrobe Police Department K-9, Rocky. Indy and Jim ran this course like they had been doing this for years! For most of the event, Indy had the fastest time of any dog, until our friend Tracy's T-Bone ran. T-Bone is a wicked fast Border Collie, who beat Indy's time by 3 seconds. However, Indy did have the fastest time among the 24-inch dogs and earned a very nice first place decorated dog bone and a refrigerator magnet. Not bad for 14 months old!! I understand that approximately $550 was raised from the Tunnelers Fun Run to help the Latrobe Police Department with Rocky's expenses. Rocky and his handler attended the event, so we got to meet them. 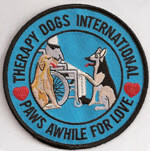 Our dogs had a fabulous time and we were glad to help this worthy cause. Here's a video of Indy's very first full agility course run at B&D Creekside Activity Center yesterday. Although he had a few bobbles, Jim was really pleased at how well Indy handled himself on course, since up until this point, they had only done shorter sequences. As you can see in the video, Indy uses those long legs to go FAST!! We're going to try him in a Tunneler's fun run this weekend. I'm sure he'll love that, as tunnels are one of his favorite obstacles. There's nothing like a little game of bitey-face wrestling to cement a new friendship between two black and white boys. Here's Indy and Mariann and Jim's Border Collie puppy Blaze as they roll around and chew on each other yesterday. Indy is such a good play buddy. He can be over the top when he plays with his best playmate, Belgian Malinois Cocoa, or he can tune it down and play with a young puppy like Blaze. He matches his style of play to whatever dog he is playing with. Not wanting to left out of all the hoopla, Indy brought home a few pretty pieces of polyester this weekend from the Splash 'n Dash APDT Rally trial! Indy started the weekend with his first run in Level 1A with a very nice 204, with first place. He followed that with a third place 207 and a first place 209 to earn his APDT Rally Level 1 title. Once again, because his first three scores in Level 1 were above 190, Indy will also receive an Award of Excellence. We then had a slight meltdown in Level 1B (Indy was totally distracted by his best girlfriend Cocoa, who was next in the ring), but still came away with a nice qualifying score of 196. Since Indy had done so well, I decided to move him into Level 2A for the last trial of the weekend, which was Indy's first-ever off-lead class in a trial. Indy had a near-perfect run in Level 2A and scored 207, with second place. His only point deduction came on a moving down when Indy chose only to down his front end and assume the play bow position, looking at me expectantly and wagging his tail!! I stared at him hard, trying to will that back end to go down, but I ultimately had to give him a second command to down and we lost 3 points. He did everything else flawlessly, including a tough bonus exercise, and I was thrilled with his performance. Wherever we go, Indy makes friends, and this weekend was no exception. I got many compliments on what a nice working dog Indy is and what a lovely disposition he has. At just over 13 months, I can't tell you how pleased we've been with Indy's training and his performance in trials thus far. He is continuing his obedience and agility training and we are looking forward to putting him in the agility ring when he reaches 18 months of age. Jazz wasn't the only one bringing home big, pretty ribbons this weekend. 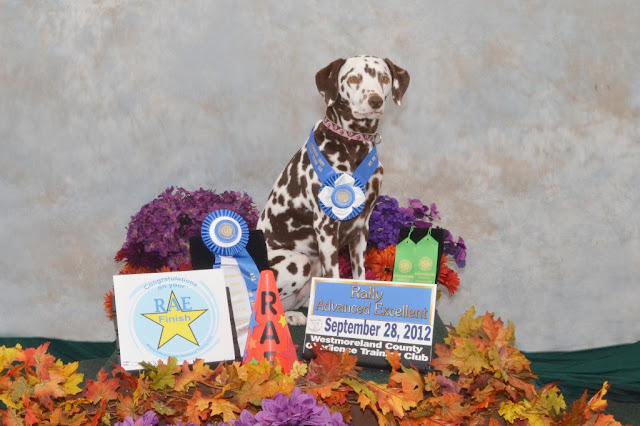 Tess earned her Extraordinaire Wildcard (ExWC) title at the same agility trial in Washingtonville, OH. This is Tess' second Extraordinaire title, which requires 30 qualifying scores in the Championship level of a class, in this case, Wildcard. All of these are working towards Tess' CPE Agility Team Extraordinaire (C-ATE) title. Go, Tess! Yesterday, in Washingtonville, OH, Jazz earned her CPE Agility Trial Champion (C-ATCH) title!!! Jazz needed two Standard runs going into this trial and qualified on Saturday and got that last Standard leg she needed yesterday to finish her Championship. Jazz and Jim are shown above with Judge Jackie Oricko. Here's Jim and Jazz with her ribbon and the beautiful C-ATCH bar made for her by her biggest fans, Aunt Mariann and Uncle Jim. Our agility buddies also had two lovely cakes to celebrate Jazz's accomplishment. We are grateful for everyone's support of our little brown Dal. Also, a big thank-you to Uncle Jim for taking photos on Jazz's big day. It's been quite an exciting few months for Indy. Just before his first birthday in September, he earned his very first title in APDT Rally. 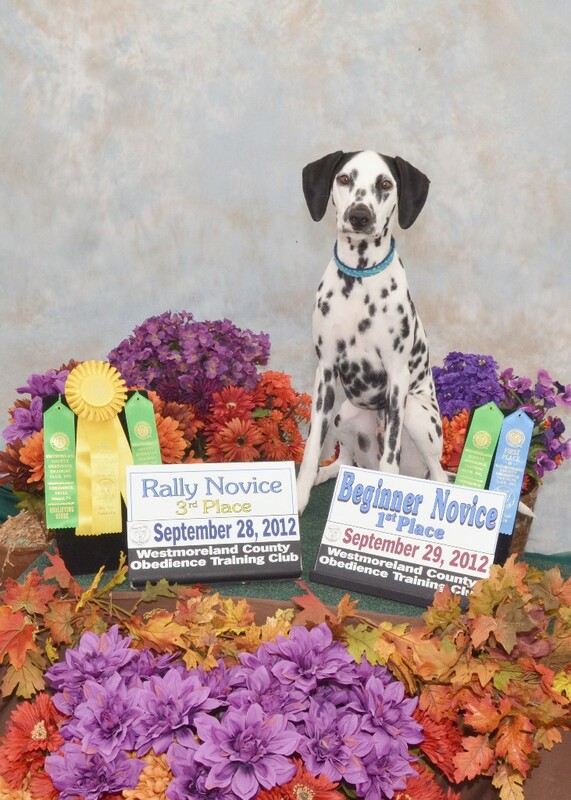 Indy quickly followed that success with his AKC Beginner Novice Obedience and Rally Novice titles. Tonight, Indy became a Canine Good Citizen! The CGC tests things like accepting a friendly stranger, sitting politely for petting, grooming, loose-leash walking, walking through a crowd, sit and down on command, recall, reaction to another dog, reaction to distractions, and supervised separation. Indy did a nice job on all elements of the test. At the same time, we also took the Therapy Dogs International test, which incorporates the CGC exercises and adds things like visiting with a crowd of people with canes, crutches, walkers, etc., leaving food that's on the ground, a startling noise, and a "rescue," where someone pretends to fall down and they gauge the dog's reaction. Indy was very tender and compassionate, and I'm proud to say that he passed the Therapy Dog test with flying colors! In a section for comments, the evaluator wrote that Indy is a "Sweet, obedient dog"! Of all the titles that our dogs have earned, the Therapy Dog title is the one that I'm most proud of and brings me the most joy, so I'm thrilled that Indy will join Tess and Jazz as a Therapy Dog. I think he'll do a phenomenal job. Thought I'd share Indy's trial photograph from the Golden Triangle Obedience Training Club trial where he earned his Beginner Novice and Rally Novice titles. 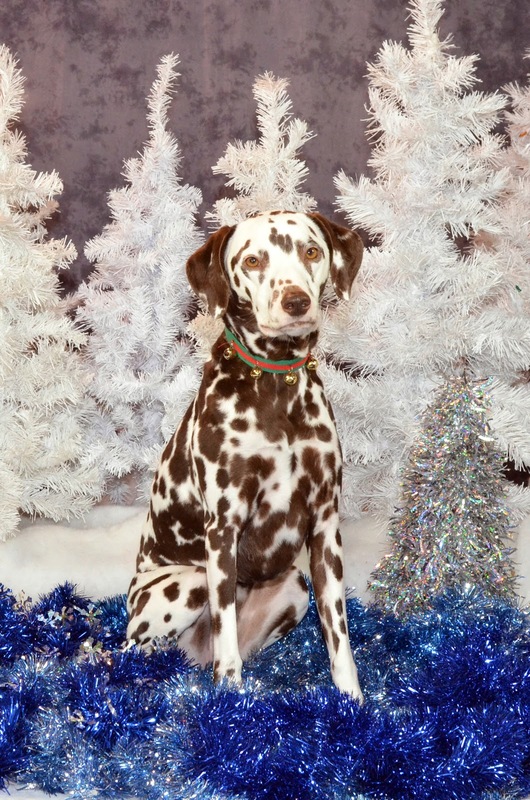 I'm told by his breeder that Indy is the first Rim Rock bred LUA Dalmatian to earn an AKC title! That's pretty cool, since Indy's litter was the first LUA litter registered with the AKC and we've supported registration for LUA Dals for many years. So proud of our handsome little guy!! Here are our three peas in a pod...I mean, on a couch!! As the weather gets cooler, our spotted family gets closer and closer. Makes you just want to cuddle right in there with them, doesn't it? Rim Rock's Out of the Blue, BN...and RN!! Another big weekend for Indy at Rally and Obedience, this time at the Golden Triangle Obedience Training Club trial! We started off the weekend with a Rally Novice B run and a nice qualifying score of 96. Then it was on to Beginner Novice Obedience, where Indy scored a very nice 193-1/2 and earned his Beginner Novice title!! Today, Indy had another nice Rally Novice B run with a score of 97, earning him his Rally Novice title. After the trial, the Rally judge was nice enough to tell me how impressed she was with Indy. He certainly has a way of charming everyone he meets! We also ran an "insurance leg" in Beginner Novice Obedience today, and Indy once again came away with a very nice qualifying score of 192. I was thrilled with Indy's performance, not only because of his high scores, but also because this was Indy's first multi-ring trial in a very large venue. Our other two trials have been in smaller buildings with just one ring, where the GTOTC trial is in a huge soccer arena and has three rings running all at the same time, not to mention kids' soccer games in the other half of the arena. Needless to say, there were a lot of distractions to work through, and although we had a few rough spots, Indy was able to concentrate on the job at hand and do very, very well. At just 13 months old, Indy is the youngest dog I've titled in both Rally and Obedience. He earned both of these titles in three successive trips in the ring over two weekends. It is looking like Indy is shaping up to be a good working dog, like Jazz. And like his big sister Jazz, he's a joy to train and to live with. Not bad for an unplanned addition to the family, huh? How fortunate we are that things worked out the way they did for us and Indy! While we were at Paws for the Cure yesterday, a Pittsburgh Post-Gazette photographer snapped this picture of me and Jazz and it was in the paper this morning! Read the whole article about Paws for the Cure here. As they say, a picture is worth a thousand words, and this one will tell you how I feel about Jazz. She is my heart's dog and so much fun to be with. By the way, I'm wearing the pink pigtails because Tess shook hers off after the costume contest and it was easier to wear them than to carry them! Seems that that then set the stage for this photo. Like Jazz, I was a good girl and wore the pink pigtails for the remainder of the walk!! The girls and I attended the Susan G. Komen Paws for the Cure event this morning at Hartwood Acres. Tess and Jazz got all decked out in their best pink attire to help raise some money for breast cancer research/awareness. While we were at my sister's yesterday, she made the girls these awesome pink ribbons to wear to the walk today! Nothing completes an outfit like pink pigtails! Tess and Jazz were very good sports about wearing the ribbons and pigtails, and although they didn't win the pink costume contest, they girls had their photo taken many, many times today in their pink finery and received lots of compliments. As always, Jazz was such a good girl. She wore this outfit the entire time we were at Hartwood Acres, including on the one-mile walk! She was going to do her part to raise money for this worthy cause. Speaking of raising funds, we want to thank the many folks who contributed to Paws for the Cure through us. We sold handmade jewelry to raise money and wish to thank the folks at UPMC Passavant, the Greater Pittsburgh Dalmatian Club, and Splash 'n Dash K9 Sports who purchased jewelry in support of Paws for the Cure. Also, a big thank you to the folks who work with Jim at Siemens who made generous contributions. Last, but certainly not least, a big hug and thank-you to my sister, who sewed purses and tissue holders and key rings to sell and also made the awesome pink ribbons that Tess and Jazz wore today. 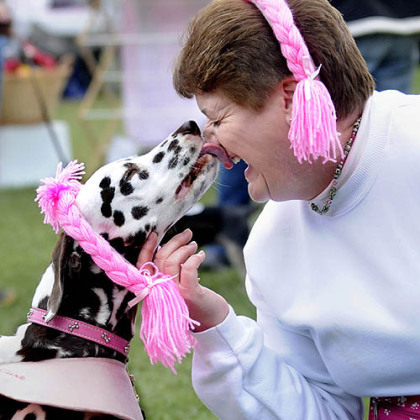 I have several women who are dear to me who have battled breast cancer, so I was so happy that Tess, Jazz, and I could participate in Paws for the Cure and help support this cause in some small way. It was a marvelous event and lots of fun, despite the chilly weather! On a nearly picture-perfect autumn day, we met up with my sister, brother-in-law, nephew, and the Dals' canine cousin Dancer at the Oglebay Fall Festival. Here's Tess, Jazz, and Indy at a fountain in the park at Oglebay. We were a little hesitant to sit Indy on the edge of the fountain with the girls, fearing that he might take a little swim in the water! Just had to snap a picture of Jazz near all those beautiful pink flowers. The Dals and their scarecrow buddy. Tess, Jim, me, Indy, and Jazz sitting for a family portrait. We had a wonderful day at Oglebay Park on a beautiful fall afternoon. I was very pleased with how well behaved the dogs were. They were polite in the crowds of people and graciously accepted pets and attention from many, many adults and children. This was Indy's first trip to the festival, and he did remarkably well. We then went back to my sister's for dinner and a little play time with the Dals' Golden cousins, so it was a good day all the way around! Jazz finished her Rally Advanced Excellent title this past weekend at the Westmoreland County Obedience Training Club trial! RAE is the highest title in Rally classes, and it requires that you qualify in both Excellent B and Advanced B on the same day ten times. Jazz went all the way from Rally Novice to her RAE without a single non-qualifying score! Jazz and I really enjoy Rally, and now that we've finished AKC Rally, we're going to move on and compete in APDT Rally. Jazz has already finished APDT Rally Level 1 and we're looking forward to moving on to Level 2 at our next trial. Jazz wasn't the only Rally/Obedience success story last weekend. It was Indy's first AKC trial, and he totally exceeded my expectations! On Friday, Indy had his first AKC Rally Novice B run, and he qualified with a wonderful score of 98 and earned third place! On Saturday and Sunday, Indy and I stepped into the Obedience ring together for the very first time in any venue, and the little guy got a first place score of 195 on Saturday and qualified with a 188 on Sunday to earn his first two Beginner Novice B legs!! By Sunday, he was reminding me that he is still a baby and that three days at a trial in a crate was too much for him. Although he still had a respectable score, he was more distracted than usual. He behaves so well that it's easy to forget that he's still very young. Jazz will be on a training break from obedience while we polish the Open exercises and get ready for competition next spring, but Indy will be back in the ring for Rally and Obedience next weekend. He's really fun to train and show...and he can only get better with age and a little experience!!! I think we've sufficiently recovered from Indy's birthday party on Sunday to post a few pictures! Here's the whole gang who attended Indy's birthday party playing a game which involved a story about Indy's first year. Here's a picture of Indy and his siblings who attended the party: From left to right, it's Jewel, Willie, Indy, and Gabe. It was great to see the puppies again and see how everyone has grown. All of these puppies have made their families very happy! Indy before he opened all those birthday presents! Indy received many wonderful and thoughtful gifts from our friends and family, including toys, treats, and even a backpack so he can help carry some of the goodies he can get when he goes shopping with the gift cards he received, too! Indy had the able assistance of my great-nephews Ryan and Logan in opening his birthday gifts. Many thanks to everyone who attended Indy's birthday party. We had a fun afternoon with friends and family, both human and canine! It was great to have a few of Indy's siblings join us for the party...and we wish them all many more happy birthdays!! The date September 11 has significance for most of us because of the events of 2001, but this date has come to have a happier meaning as we celebrate Indy's first birthday today. September 11 is also the birthdate of our friend LaDonna, and because Indy's litter was born on her birthday and was actually made up of the exact number of males and females in LaDonna's family, the litter was named after them. 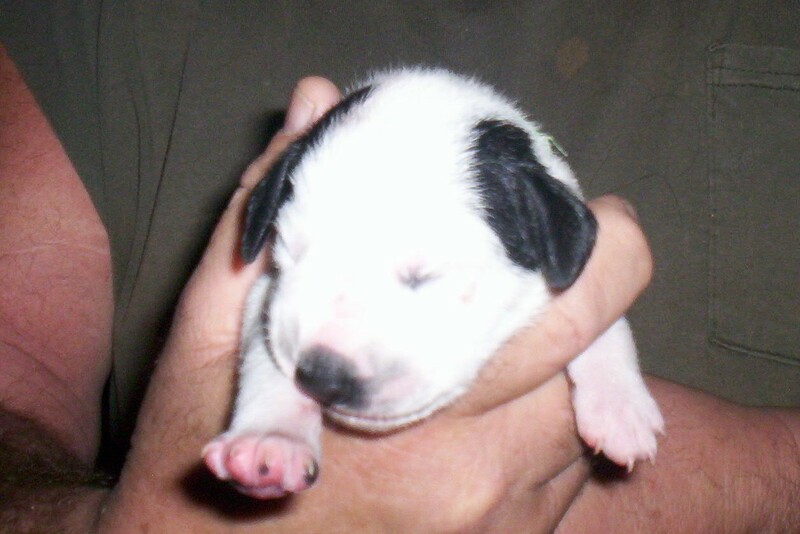 Indy was known as Dalton, after LaDonna's adorable grandson. The picture above was taken when he was just five days old. If you follow our blog, you know how Indy came to be Rim Rock's Out of the Blue and became a part of our family, despite the fact that we hadn't planned on adding a puppy at that time (see Out of the Blue post). This little guy has been a great addition to our household and has brought us much joy and laughter. He has the sweetest personality and makes friends wherever he goes. He's lovable and smart and has been a blast to train. We're so glad that Indy dropped into our family "out of the blue"! While Indy's actual birthday is today, his first birthday celebration with his human and canine friends will be this coming Sunday, so stay tuned for photos of Indy's birthday bash! This weekend, myself, Jazz, and Indy were entered in our very first APDT Rally trial at Keystone Canine Training Club. Here's Jazz with her ribbons. Jazz completed her APDT Rally Level 1 (RL1) title this weekend with two perfect 210 scores and a 207 in the A class. She also completed one leg in the B level, with a score of 202. Because Jazz's first three legs in Level 1 scored 190 or above, she will also receive an Award of Excellence. APDT is a great venue to compete in, because they offer a Puppy level of competition with only 10 stations to get young dogs used to being in the Rally ring. 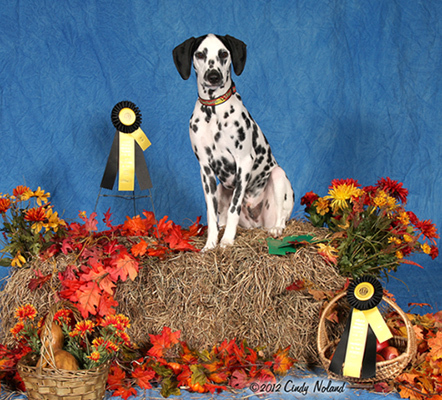 Indy did a great job this weekend, earning his Rally Level Puppy title in the A class with scores of 203, 205, and 207!! Because his first three scores were over 190, he will also receive an Award of Excellence. Indy went on to earn a leg in the Puppy Level B class, with another 207 score. This was Indy's very first time in the ring for any sort of competition, and I am so proud of how well he did. By the end of the weekend, he had an entire cheering section and everyone, including the judges, fell in love with his little mannerism of lifting a front paw every time he sits! Not only did Indy earn his very first title (days before his first birthday), but he did it with four first place finishes! I'm really pleased with how well our little guy handled the trial environment and continue to be thrilled with his awesome temperament. Indy loves every person and dog he meets and is just a happy, amiable dog. Thus ends a wonderful weekend, Friday spent with our conformation friends at the DNA Specialty in Ohio and Saturday and Sunday spent with our Rally and Obedience friends. Although I am not anxious to head back to work tomorrow, I am looking forward to Indy's birthday party next Sunday. Stay tuned! 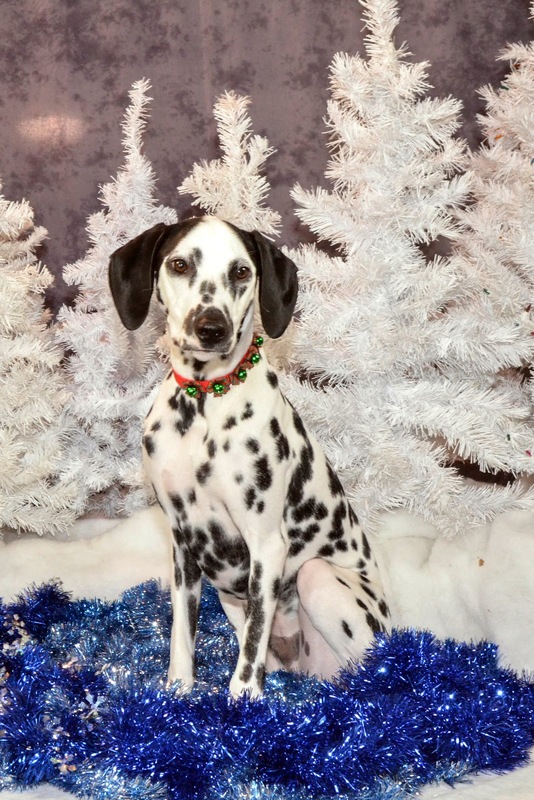 This past Friday, we went out to Ravenna, OH, to help with the Dalmatians of North America National Specialty. While we were there, we had the opportunity to have Tess and Jazz Temperament Tested through the American Temperament Test Society. For those of you not familiar with the test, it's sort of a more rigorous CGC test. The test is run as if you're taking a walk in the park with your dog and encounter various real-life situations. There are ten stations measuring the dogs' behavior towards strangers, auditory stimuli, visual stimulus, tactile stimuli and self-protective/aggressive behavior. The tests include meeting a neutral and a friendly stranger, approaching and investigating a hidden noise, response to gunshots, having an umbrella suddenly open, walking on plastic and wire footing, and the most interesting part of the test, the "weird stranger." An oddly dressed individual appears and acts erratically, and as he approaches the dog and handler, his actions and demeanor become more threatening. The test gauges the dogs' ability to detect a potentially threatening situation and realize when it progresses to aggression toward the dog and handler. Dogs are permitted to react to this situation, but they are looking for an appropriate reaction for the breed and a quick return to baseline after the situation resolves. Not only was it fascinating to watch other dog/handler teams take this test, but I'm proud to say that both Tess and Jazz passed their Temperament Test with some very nice comments from the evaluator. 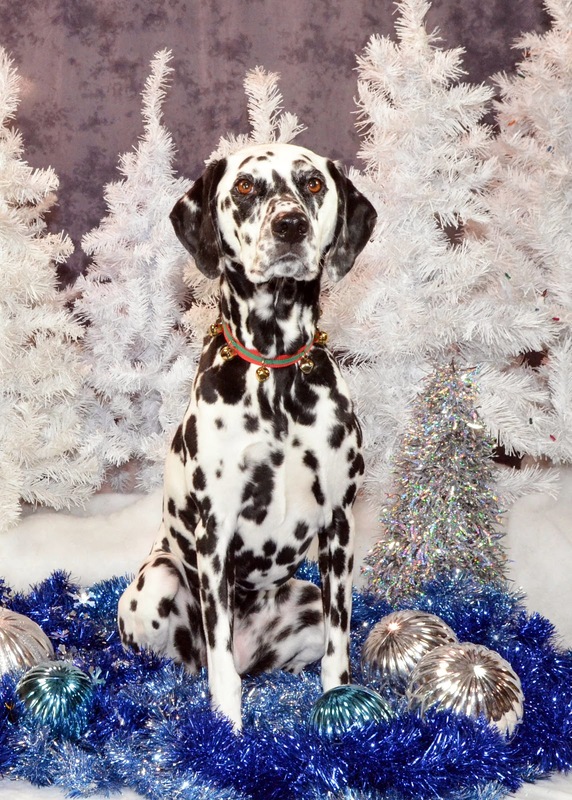 To date, only around 250 Dalmatians have passed this test, and I'm so pleased that Tess and Jazz are among them!